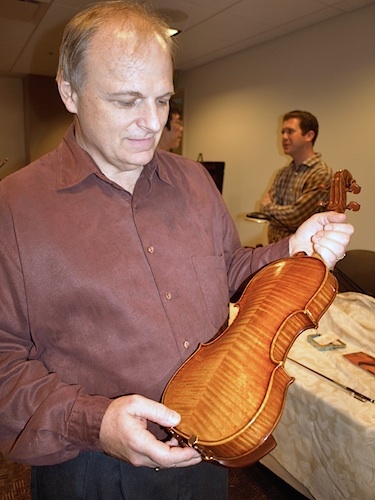 More than a dozen violin makers from around the world gathered in Indianapolis last weekend for a exhibit at the Indiana History Center, in conjunction with the International Violin Competition of Indianapolis. The opportunity to meet these makers and play their instruments certainly influenced my decision to attend the competition in person. 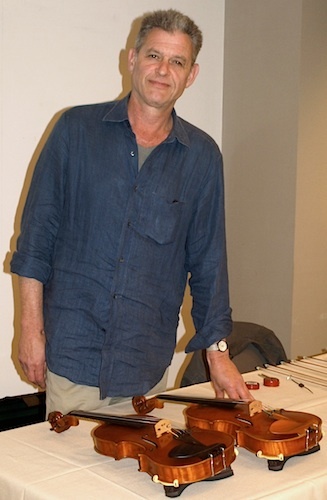 The "Spotlight on Today's Violin Makers" included makers such as Gregg Alf, Gerry Borman, Joseph Curtin, Joseph Grubaugh, Feng Jiang, Francis Kuttner, Frank Ravatin, Guy Rabut, William Scott and Isabelle Wilbaux, as well as Indiana makers Ted Skreko, Chris Ulbricht of Indianapolis Violins, Alexander Leyvand, Mark Russell, Todd Matus, Tom Sparks, Mark Womack (and his assistant Luke Marvell) and Michael Duff of Berg Bows. I tried to make it to everyone's table over the two-day exhibit, and I also tried to play everyone's fiddles. That said, the exhibit took place in two rooms, with talking and playing, and much noise! I was not able to reach everyone, and I don't feel I can a definitive opinion on these violins after playing them for a few minutes. But I will give you my impressions, my pictures, and a few thoughts from these makers. If you are interested in a violin from a modern maker, it makes sense to contact the maker, and that information is hyperlinked below with their names. 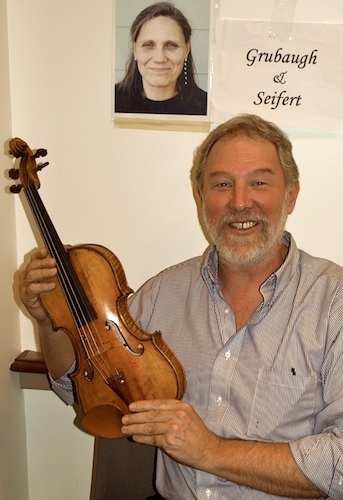 First I visited Gregg Alf of Alf Studios, who is shown here holding a late del Gesu model (the "Ole Bull") violin, and behind him is his assistant, Zach Moen. Alf made his first fiddle in 1975. I was hoping to get to know Alf violins better – he was going to lend us a few for chamber music! But the week was so busy, no chamber music happened. I appreciated his offer though! Tom Sparks stood at a table nearby with two violins. 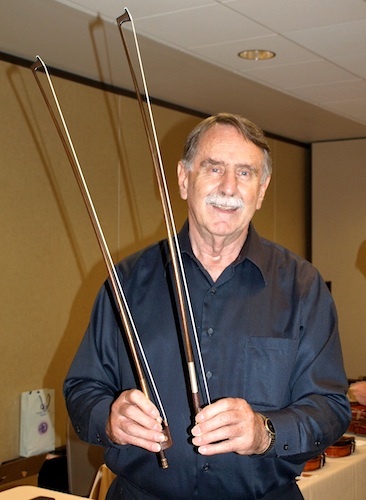 Sparks teaches at the Indiana University Jacobs School of Music String Instrument Technology program. The program currently has about 40 students – 20 in the violin-making program and 20 taking general classes in history and diagnostics. It's possible to get an associate degree, Bachelor's degree or a minor in string instrument technology at Indiana University. For his fiddles he uses new wood, from which he extracts the organic matter out of it with water. "It's green wood, but there's nothing green about it when I'm through with it." He's come to this method after many years. "I've got thousands of dollars in ruined wood and 20 years of experimentation," he said. 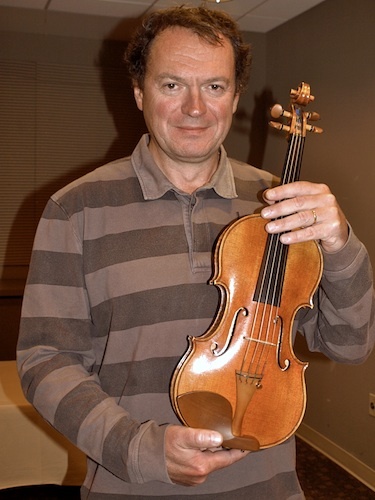 Violin maker Joseph Curtin was conducting a scientific experiment all week, with the help of Paris scientist Claudia Fritz and Fan-Chia Tao of J. D'Addario strings. I actually participated in the experiment, in which I was blindfolded and asked to choose between 10 pairs of violins; then after that, asked to discern characteristics between six violins. It was like wine-tasting – I was tipsy by the end from playing 20 + fiddles! I won't know what I chose until the experiment is completed and results are compiled in several months, but the idea was to get feedback from players on their preferences. Curtin said that he spends a lot of time doing writing and research. I asked him what models he used for his fiddles and he held up one of his fiddles and quipped, "This is an exact copy of an imaginary violin!" He said he made about six violins a year, and the one I tried out had a clear, penetrating sound. 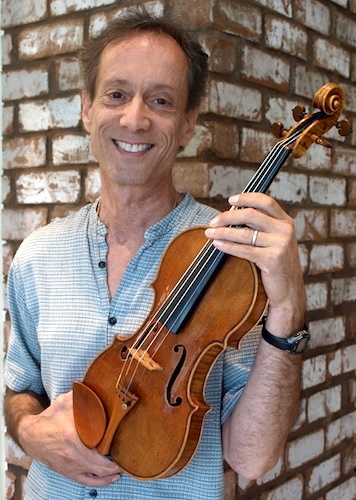 Francis Kuttner described his fiddles as being patterned after "a mishmash of models, I've borrowed from different makers over the years and it's evolved into my own model." The violin I tried had a ringing sound that was even on all four strings and smooth. The violins of Feng Jiang made quite an impression among people attending the exhibit – a number of colleagues singled his out. I did get a chance to sneak into a recital hall with one of his violins, most of which are patterned after a Guarneri model. His violins are currently priced at $22,000. The violin I tried sounded smooth, responsive and open. Feng gave me a good way to remember which plate is made from which kind of wood: the top is the "Christmas tree," spruce; bottom is maple. Got it? Top=spruce, bottom=maple. Originally from China, Feng Jiang has been making violins for 21 years and has been located in Ann Arbor, Michigan, for 13 years. Rabut's violins go for $25,000, and he's itching for someone to commission a few more of those contemporary-look moderns – maybe for a contemporary music ensemble? I enjoyed talking with Guy, who can be philosophical. "When the (price of) Strads went through the roof it made it impossible for students to buy – and it made it possible for me to have a career," he said. 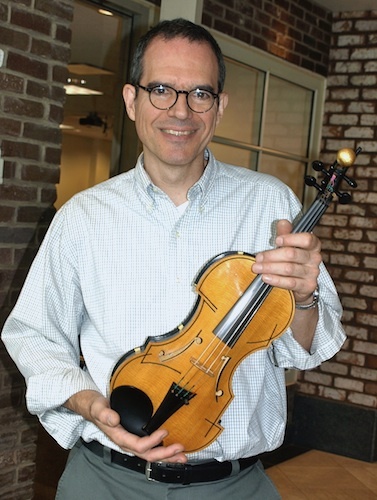 No longer do people feel that getting a modern violin is just a temporary solution, until they can buy an old Italian fiddle by a famous maker of the past. "The younger players are saying, 'Which maker did you talk to?'" he said; young violinists are getting the modern instruments with the intention of making them their own. Terry Michael Borman has been making violins for 35 years, and the word that came to mind while testing his instruments was "sweet tone." Borman said that musicians' input is very important to him. "Musicians are never wrong," he said. "In fact they can be absurdly right! Most of my instruments have been modified from musician feedback." His violins go for $32,000 and violas for $34,000. 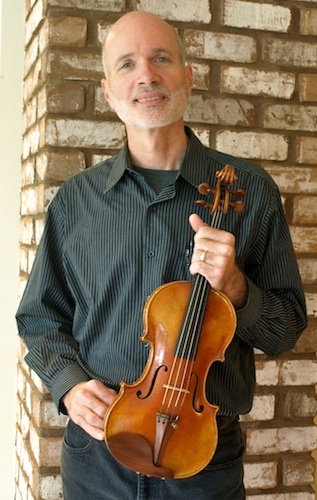 William Robert Scott, or "Bill Scott," of Minneapolis, had a number of copies that he'd made, of the 1733 "ex-Kreisler" del Gesu; 1720 "ex-Rochester" Strad and 1742 "ex-Beno Rabinoff" del Gesu. "Really playable," is what I scribbled after trying his fiddles. Joseph Grubaugh was on hand from Petaluma, California, and his partner Sigrun Seifert was there in spirit. He showed me several violins; one was a copy and the other not. The copy was $38,000, the other was $28,000. 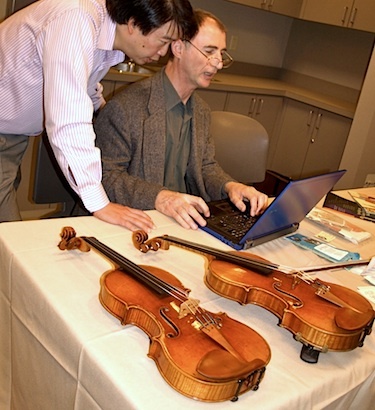 "A copy is like repairing a violin into existence – it's a lot more work," Grubaugh said. I tried some bows from Berg Bows, which are composite fiber bows. They are not, said bowmaker Michael Duff, "carbon" fiber, but they are another kind of fiber that is less dense and more like pernambuco wood. I would have loved to have taken one of these babies home (I actually need a bow), but the first price he quoted was $7,500, which seemed a bit much for a composite bow. He amended this to say their bows were anywhere from $2,500 to $7,500. At any rate, I still liked the bows! I hope that the above information helps to give you a starting point for modern makers. It was my starting point with these makers as well, and because I did not have the time or proper situation to truly test every maker's instruments, I simply can't give you anything but my impressions. Besides which, instruments are very individual. I will say that all the above are worthy of consideration if you are looking for a modern instrument. They are also live makers, which gives you the benefit of being able to talk with them and create something that suits you. 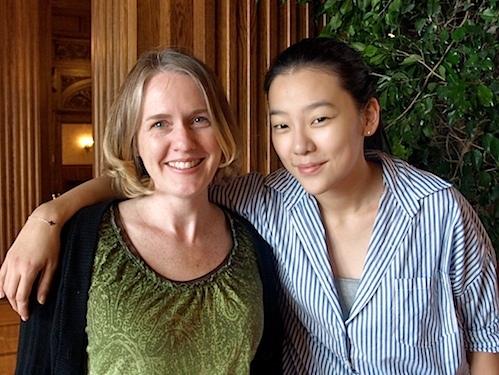 You may have noticed, if you were watching, that gold medal laureate Clara-Jumi Kang appeared to be tears Friday night after her performance of the Beethoven Violin Concerto at the 2010 International Violin Competition of Indianapolis Finals. Actually, the real tears came the day before. The Guad has a very bright sound, and "sometimes it has a personality I can't control." By contrast, her normal violin has a darker sound. "I was used to that phrasing" that comes out of a darker violin, and "somehow nothing seemed to work." Clara-Jumi, 23, has perfect pitch, and she was accustomed to a 443-hertz "A" in Korea, or a 444 in Europe. 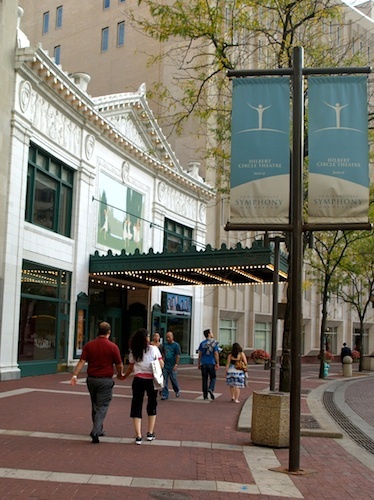 The Indianapolis Symphony used a 440 "A" – much lower. "I was used to the higher sound," she said. Putting all those things together, everything felt out of her control. But then she came to a profound realization: "I found myself thinking that Beethoven is much too great for me to control it," Clara-Jumi said. "It's from above this earth, and I should just play it, just worship it as something from above. That is what I focused on all evening." "I was so into the music," she said of her performance of the Beethoven at the Finals. "I am blessed to have played the Beethoven with orchestra eight times – nobody wants to play the Beethoven with you when you are 23. "(On Friday) I was playing it like I was worshipping it – that's why, after the performance, I had tears running," she said. They came from her deep emotion for the Beethoven and from her sadness at the piece coming to an end, the competition coming to an end. "It wasn't because I was upset or because I didn't like my playing. "I love Beethoven too much," Clara-Jumi said. "If this concerto didn't exist, maybe I wouldn't love the violin as much." Clara-Jumi started playing the violin when she was three years old. Her parents – both opera singers – had planned for her to play the piano. "I said, 'No," I wanted something with a longer sound." The Beethoven was always her favorite violin concerto, and she had more CDs of it, with more violinists, than she can count. She used to fall asleep listening to the Beethoven. "The timpani would make my heart beat," she said. "I guess it just grew into me." "With Beethoven, every time you play it, it's so different – the feeling you have, the phrasing," Clara-Jumi said. "I get surprised with what feeling I come to." She said she has eight or nine scores of the Beethoven and tries to use a different score each time she studies the piece, without writing in many fingerings or bowings. "I try not to touch Beethoven's dynamics – Beethoven has a strong dynamic," she said. Performing Beethoven, "sometimes you feel like you are getting all your weaknesses pulled out of you in public," Clara-Jumi said, "but sometimes it touches people's hearts." I spoke to Clara-Jumi Kang on Sunday, right after she rehearsed Waxman's Carmen Fantasy at the Scottish Rite Cathedral in downtown Indianapolis for her final appearance at the IVCI awards ceremony. It would be her first performance as the competition's gold medal recipient. Clara-Jumi was admitted at age four to the Mannheim Musikhochschule and at age seven to The Juilliard School. 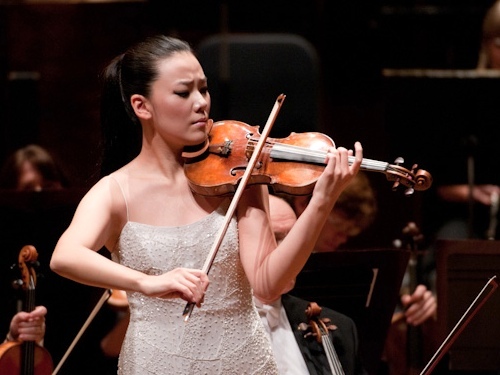 Her teachers have included Zakhar Bron, Dorothy DeLay and Nam Yun Kim. The IVCI was by no means Clara-Jumi's first international competition – she won first prize in the 2010 Sendai International Violin Competition, second prize at the 2009 Hannover International Violin Competition; and first prize at the 2009 Seoul International Violin Competition. I wondered if the Indianapolis competition was different in any way from these other competitions. "It has an incredible host family system," she said of the Indianapolis. She had worried about whether or not she would be able to perform her best, under the circumstances of living with a host family, but she found that it worked very well. Her host family gave her an attic bedroom with its own bathroom, and "I could be upstairs alone for two hours and not feel bad about it," she said. "They made me feel like, 'You play a concert, and then rest.'" They also showed her around town and fed her well, she said. She also felt happy with the audiences in Indianapolis. "The feeling I had onstage was that the audience seemed happy to hear the music. I can feel it when I play, if someone is into me, listening to me," Clara-Jumi said. "Something about America is attractive; the audiences don't hold back their feelings." For example, they don't hesitate to give a standing ovation. "Sometimes you play in other countries and they tend to show feelings in a different way,"
She said that she used to have a bad attitude toward audiences when it was clear that people were not listening. Over time, she came around to a different feeling about it. "Now I want to play for everyone. My love for music was bigger than other people's negative thoughts in the audience." "I think it helps if you are on stage more often," Clara-Jumi said of finding the right mentality for approaching performance. "Having a stage presence is important, even in competitions." For her, the competition went in four stages, coinciding with the four rounds. The second round felt completely different, playing a Beethoven violin-piano sonata; a non-Beethoven violin-piano sonata and a showpiece. She played Beethoven Sonata No. 3 in E flat, Op. 12; the Ravel Violin Sonata; Joan Tower's "String Force"; and Waxman's "Carmen Fantasy." The Classical Finals were made even more interesting for her by the selection of a new Mozart – or at least one that had been in storage for a while. "I wanted a fresh start for Mozart," Clara-Jumi said. "I felt like I was playing Mozart Four out of habit. And I like the Turkish (section in the last movement of the fifth concerto) very much," though that last movement proved hard to memorize, she said, the way it keeps repeating with different decorations. "I was very nervous for this competition. I ate this many blueberries," she laughed, indicating a large bowl with her hands. "I think a nervous feeling is always a good thing, as long as it doesn't interfere with your playing. When she was about to go on stage for one of the final concerts, conductor Samuel Wong asked, "How do you feel?" "And somehow his comment really helped," Clara-Jumi said. She was grateful for his support and for that of the the orchestra. "Samuel Wong made me feel like I didn't have to give him too many cues," she said. "I could close my eyes and just play." Clara-Jumi tends to think in terms of a singing line – her parents are opera singers, and her father sings things such as Wagner. "When I was in my mom's stomach, she was singing at La Scala," Clara-Jumi said. Her mother stopped singing publicly when Clara-Jumi was born, but her father has continued. Though she looks up to violinists such as Anne-Sophie Mutter, David Oistrakh, Jascha Heifetz and Ivry Gitlis, her father counts high among the people she admires. "The reason my father is one of my idols as a musician is not just because he is my father," she said. "My father has always been true and honest to music." He has tried to ignore the politics of music. "He said, 'Try to win with your music, never try to concentrate on how you effect people. Think of your language as a musician and be true to yourself as a musician.' I think I'm about to follow his path," she said. She said she would like to bring music to places where people may have never heard a violin, in poorer countries. "I would like to heal people with music," she said. "There are so few thing that can heal people's hearts – music is one of them." 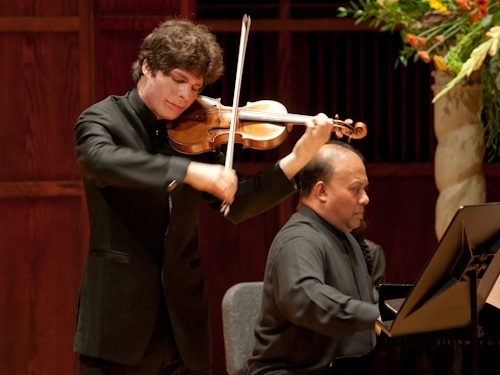 On Saturday the 2010 International Violin Competition of Indianapolis concluded its final round of competition, with performances of the Sibelius Concerto by Benjamin Beilman, 20, of the United States; of the Tchaikovsky by Haoming Xie, 20, of China; and of the Sibelius Concerto (yes, two in one night) by Soyoung Yoon, 25, of South Korea. Saturday's performances commenced with Benjamin Beilman, who began with a good icy, still tone in the Sibelius (this Finnish gem is always best, served on ice). But though many things seemed poised to go right, a number of technical details simply went wrong with intonation in octave passages. Beilman seemed to have an off night. When it came to the orchestra, Sibelius can be rhythmically complex and ambiguous, and the lack of precision made for a muddy effect during orchestral tuttis. Haoming Xie played the Tchaikovsky Concerto, using a combination of ideas from the Auer and Tchaikovsky editions. A few things parted ways with the score, such as the runs in both the exposition and recapitulation, which were mis-counted (kudos to the orchestra for following) and part of the cadenza was missing. The last movement was extremely fast, and Xie had the technical ability to make that happen, though it was fast for the orchestra. Soyoung Lee wore a gold dress for her appearance this last night (go for the gold!). Her Sibelius was spellbinding, and she nailed all the very difficult technical passages. She made perfect octave runs, even chromatic ones, look easy. The orchestra seemed a bit more attuned to the details for this Sibelius, save a conspicuous missed entrance by the flute. At the end of the evening, while the jury was deliberating. Indianapolis Symphony Concertmaster Zach De Pue led a blind "taste" test, with help from master of ceremonies Steve Shipps. He played four pairs of violins, allowing the audience to decide which they liked best of each pair, based on playing excerpts from “Scheherazade" and Strauss' Don Juan. Each pair included one old and one modern violin. The votes were very close each time, but ultimately the audience chose one modern violin and three Strads, from the years 1699, 1714 and 1715. 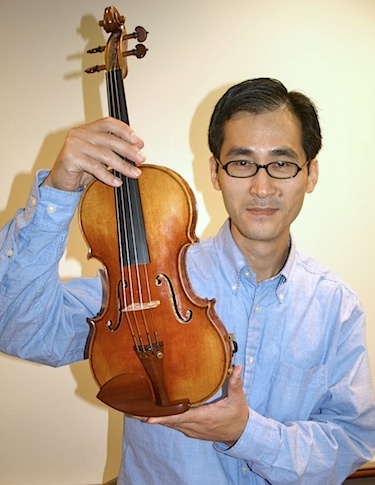 Several more tests and votes narrowed the fiddles to the one the audience liked best: Jimmy Lin's 1715 Strad. Clara-Jumi Kang performing in the finals on Friday evening. Photo by Denis Ryan Kelly, Jr.
On Sunday, I also interviewed Gold Medalist Clara-Jumi Kang - look for my interview here on Violinist.com later this week. What does the jury really talk about during a competition? Are there too many competitions? How do the judges decide? These are a few of the questions that various panels have been exploring each night before each round of the International Violin Competition of Indianapolis. On Wednesday night, Heather Kurzbauer of Amsterdam, who has covered many competitions over the years for The Strad magazine and who has also served on the critics jury for the Hannover International Violin Competition in 2009, spoke about the difference between American competitions and others around the globe, about judging competitions and about their value. She was joined IVCI Executive Director Glen Kwok. What is the value of a competition? Does it really help launch careers? "It depends, but certainly many careers have been launched by competitions," Heather said. "I think competitions are helpful to launching careers if one thinks about them in the right way." Competitions allow all competitors – not just the winners – to gain public exposure. "I don't agree that competitions are for horses," Heather said. "How else would we meet these wonderful people from all over the world? We love our local heroes, but this gives us a chance to hear someone from halfway around the world." It also allows students to receive advise and mentoring from jury members from around the world. Glen added that nowadays, with the Internet, "Every performance you give, literally the whole world truly is watching," noting that listeners from at least 100 countries have tuned in this week to watch the current Indianapolis competition over the Internet. Also, people can e-mail each other about performances that excited them and watch the archived performances many times, thanks to the Internet. What are some of the mistakes contestants make? One mistake they can make is their choice of repertoire, Heather said. For example, it doesn't make sense to play two intense 20th century pieces in a row, or for that matter two pieces of any genre back-to-back. "You have to think of the psychology of the jury," she said. Don't make them tired. Another mistake can involve what the contestant wears. "Wear things that make you comfortable onstage," Heather said. "Especially for women, you need to get some really good advice about what to wear" so that it does not detract either from the music or from your own level of comfort. A strapless gown that is constantly falling down and requiring adjustment is not the best bet. When the jury is splitting hairs, deciding between players of almost identical skill level, what causes one to win over another? One jury member from another competition told Heather that he asks himself, “Would you pay money to hear a recital by this contestant? Who is the musical memory-maker for you? They are all good girls and boys, but who is the one where you say this is the musician? "It's what makes you go on Youtube and listen to Fritz Kreisler," Heather said. "It may be a little out of tune and smeary, but then you find yourself in tears." How much discussion goes on between jury members? Said Glen Kwok: "Our philosophy for Indianapolis is there should be no discussion. When I share with the jury who the semi-finalists and the finalists are, they are hearing it for the first time." An audience member asked: Shouldn't all the pieces be the same, for the sake of scientifically ranking the contestants? "You, as the audience, would go crazy, and the jury would go crazier," said Glen Kwok. "I think that's where music and science diverge," Heather agreed. After hearing about 10 Sibelius concertos, you stop looking forward to it. Being able to choose pieces "shows so much more depth of musicianship," Glen said. What if the jury does not agree with the way a contestant has chosen to play a piece? This can be a big issue, when one starts talking about "historical" and "correct" performance of Bach and Mozart. One thing is for sure: there will be dissension. "The nine individuals on this jury come from very different musical cultures," Heather said. Glen added that the World Federation of International Musical Competitions requires for certification that 50 percent of the jury not be from the host country. Are there simply too many competitions? asked another audience member. "I don't think so," Heather said. Having many competitions across the world "ups the ante and broadens the chance for exposure for young musicians." It was an all-Mozart evening Wednesday at the International Violin Competition of Indianapolis, with three of the six finalists playing in the Classical Concerto Finals. I was not here for the preliminary and semi-final rounds of the competition last week, so this was my first time hearing violinists Andrey Baranov, 24, of Russia; Antal Szalai, 29, of Hungary; and Clara-Jumi Kang, 23, of Germany and South Korea. They did not disappoint. I now see the reason for all the buzz I've been hearing about the “high level” of this particular pool of contestants. About 270 people came to hear the concert, held in the the Christel DeHaan Fine Arts Center. 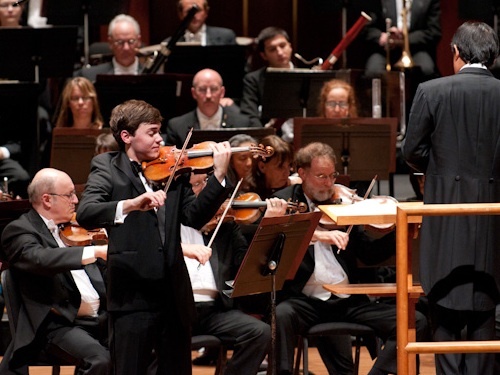 Each violinist was accompanied by the Indianapolis Symphony Orchestra, with guest conductor Samuel Wong. Unfortunately the orchestra was plagued with faulty horn entrances and timid string playing, which contrasted rather conspicuously with the degree of polish and shine each soloist brought to the endeavor. Whether the orchestra or solo part, Mozart is revealing and unforgiving. Every entrance must hit the target dead-on; every last bit of intonation must be pristine. Call it the high-definition television of classical music: every little flaw will show. The evening began with Mozart's Violin Concerto No. 5 in A major played by Andrey Baranov, playing on his 1682 Andrea Guarneri. He got things rolling with a little surprise run into the Allegro Aperto, a movement which he played with a nice, bouncy feel. He used a cadenza I did not recognize, perhaps his own? His second movement was simply-stated and straightforward. Before the second-movement cadenza, I enjoyed the effective way he melted his sound into the accompaniment to bring out the line in the woodwinds and orchestra. His presence on stage was solid and assuring. Next up was Mozart's Violin Concerto No. 3 in G major, with Antal Szalai, whose fiddle seemed a bit low, but maybe it was just the darker color of its sound in comparision to Baranov's. These are the kinds of inadvertent comparisons that creep up in competitions! I enjoyed the way his second movement ended, and then how the third movement seemed to suit him so well. Clara-Jumi Kang also played Mozart Concerto No. 5, though I did not feel even slightly tired of the piece, hearing it twice – both Baranov and Kang had their own versions. Kang's was elegant and clean. I noticed at least one occasion in which she was using extensions to get around the fingerboard, which when played with accuracy (as she did), can make things even cleaner. She used the Joachim cadenzas, and I would certainly point any student of mine to her performance for a nice primer in using these oft-played cadenzas to good effect. I found her “a la Turk” in the last movement to be downright exciting, full of verve and precision, with well-channeled energy. Tomorrow night: the second night of the Classical Concerto Finals, with Benjamin Beilman, 20, of the United States, playing Haydn Concerto No. 1 in C; Haoming Zie, 20, of China, playing Mozart Concerto No. 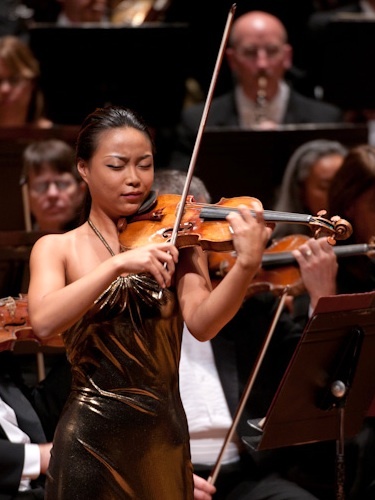 5; and Soyoung Yoon, 25, of South Korea playing Mozart Concerto No. 3. And the wonderful thing? You can listen to the performances I described above, and to the ones tonight! 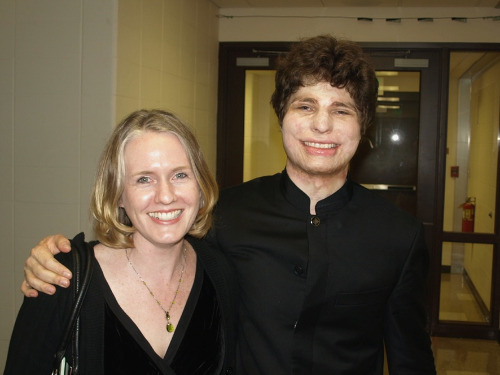 I'll just say it: they picked a true winner in 2006 when the International Violin Competition of Indianapolis awarded Augustin Hadelich the gold medal. 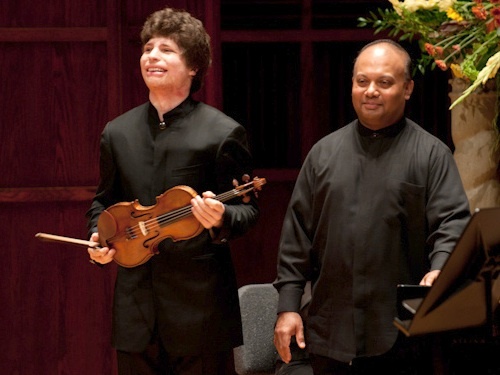 On Tuesday evening violinist Augustin Hadelich, collaborating with pianist Rohan De Silva, performed a recital in Indianapolis for those gathered for this year's International Violin Competition, which has entered its final week. The program included Beethoven's violin sonata No. 8 (Op. 30 No. 3); Schnittke Sonata 1; Ysaÿe solo Sonata No. 4; the Poulenc Sonata and Zigeunerweisen. Certainly I'm speaking of Hadelich's playing as “winning” – so well-calibrated, engaging and clean. But I'm also speaking of his four-year commitment to the immense work required of being violin soloist and taking advantage of the opportunity given him by that gold medal, as evidenced by the long and growing list of orchestras with whom he has performed, including the New York Philharmonic, Los Angeles Philharmonic, Cleveland Orchestra and way more; as evidenced by his release of two CDs in that time. Tuesday I noticed something else, Hadelich's engagement with his audience, which I believe has also grown steadily since I first heard him play in 2006. I started noticing it in the middle of the Beethoven: He plays with a generosity toward his audience, demonstrative and communicative. Serving the music, and serving it to the audience. Tuesday evening Hadelich was performing with his new violin, having relinquished the “ex-Gingold” Stradivarius for the competition's 2010 winner, which will be decided over the next four days. (You can see and hear the action here, it's being liveeamed from the IVCI website and performances are immediately archived.) Now Hadelich is playing the 1723 “ex-Keisewetter” Stradivari, on loan to him from Clement and Karen Arrison, through the Stradivari Society. At times I wished the violin were a bit louder, though I'm not sure if the acoustics of the Ruth Lilly Hall in the Christel DeHaan Fine Arts Center at the University of Indianapolis were a factor, or perhaps the fact that he's had just six weeks to adjust to a new fiddle. For me, one of the most enjoyable pieces of the evening was the Sonata for Violin and Piano, Op. 1, by Alfred Schnittke, a piece which draws on a well-organized tone row. The first Andante begins with thin line of sound from the violin, with barely any vibrato, then “pling!” from the piano. It proceeds in gestures: a super-quiet pizzicato chord, a rhythmically driven passage, a dance and much noise. The Largo began quietly, with long, pitch-bending notes, no vibrato. In one moment Hadelich had it sounding like a prayer, but somehow impoverished. Then vibrato – a ray of light. Hadelich and De Silva had the audience in a spell by the end of the Largo, after which there was utter stillness and silence in the hall – I dared not move my pen. There were a number of moments like these. The evening seemed to demand a piece by Eugene Ysaÿe – Ysaÿe being Joseph Gingold's mentor and Joseph Gingold being the founder of this competition. Hadelich played solo Violin Sonata in E minor, No. 4, in which he negotiated the multiple voices expertly and worked with many layers of dynamics. Something I noticed, as Hadelich swept through the introduction of Sarasate's Zigeunerweisen, was his acuity with the bow – the sun can rise and it can set, and the birds can chirp in between, all in one bow. The latter half of Zigeunerweisen was a joy ride, maybe on an Indy car. It was just fast, baby. About 148 mph. Maybe more. 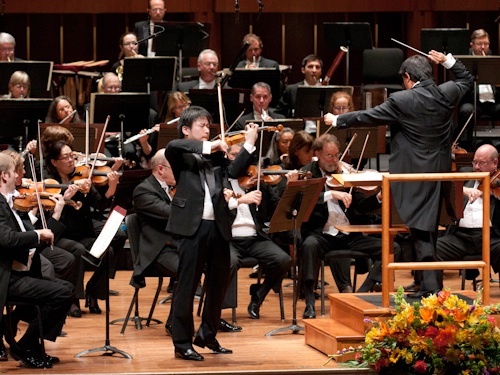 Fritz Kreisler's “Liebesleid” – Love's Sorrow – ended the evening with simplicity and grace. I'm looking forward to hearing this year's finalists over the next week. 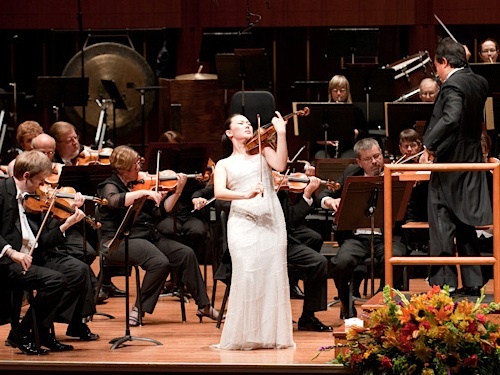 Congratulations to the six finalists in the International Violin Competition of Indianapolis! The two-part finals begin Wednesday. Three finalists each night will play with the Indianapolis Symphony Orchestra on Wednesday and Thursday evenings in the first round, and again on Friday and Saturday evenings for the second round. 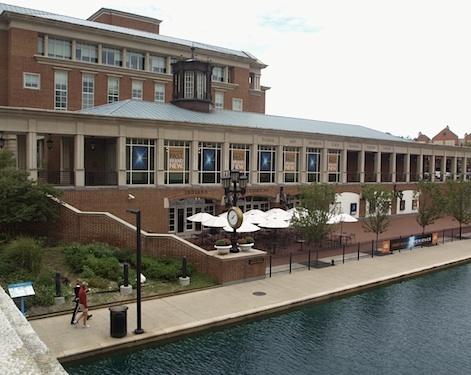 I will be in Indianapolis for the finals and writing about the event here on Violinist.com. 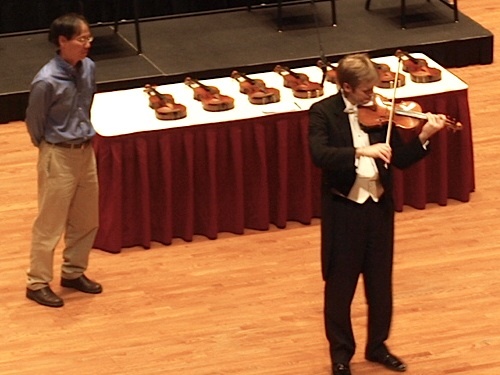 You can watch the events live online at the competition's website, http://www.violin.org. Congratulations to the semi-finalists in the International Violin Competition of Indianapolis! Here is a schedule of when they will perform. Listen and watch performances here. I will be there as of Tuesday to bring you more about the last week of the competition. Can't wait! I was taking a trial art lesson with my daughter, and the topic at hand was sketching. He wanted us to first try it, then he'd talk about technique. Sure, why not? I'm not too bad at drawing, though my last class was a long time ago. I took the sketching pencil and drew a long, sideways oval, the opening of the mug. Then I drew lines on either side, then the curved base of the cup. Next to it, a circle. A stem. Okay, done. I looked up. What now? Obviously the teacher wasn't exactly expecting me to finish this in two minutes, he was on the other side of the room, attending to other students. I looked at my little drawing. I looked at the apple and the mug. I looked around. My daughter was sketching in the shadows. Oh right, the shadows. I looked at the apple again, and the cup. I squinted. Yes, shadows! I see them now. So I started drawing the shadows. Then I noticed that the indentation for the stem of the apple made a rather interesting shadow, a bit elusive to draw, but maybe if I looked at it longer...I began to see the inconsistencies on the skin of the apple – a scratch here, bits of color here and there. How to capture that in black and white? Then there was the mug, it also had some texture to it – different from the apple. How to convey that? By the time the teacher came back, I was completely immersed in all the fine details of what an apple looks like, and what a mug looks like. I realized that one of the most important assets, for a person creating visual art, is the ability to see. After that comes technique, that is, the ability to competently render what you see. Equally important is judgment and restraint – you may see every detail, but the best kind of artist knows how to suggest without painstakingly drawing every last thing. You show the viewer what you want them to see, and suggest the rest. These were my thoughts, and I do believe that there is a parallel in music. When I wrote last week about the importance of listening, many agreed it was important, but others thought that listening would somehow corrupt a person's interpretation. Not so. A person who doesn't do anything but imitate was not ready for an “interpretation” anyway, that person is still learning technique and learning to listen. It is important to listen, and it is important to hear – hear everything! The more you look, the more you see, and the more you listen, the more you hear. 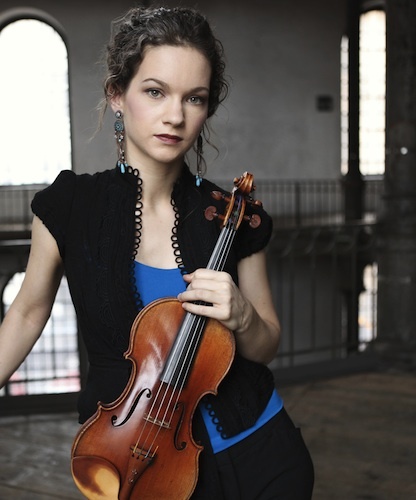 Recently I've been listening to Julia Fischer's new recording of the Paganini Caprices. Before you dare tell me that there are too many recordings of the Paganini, listen to it. There are some beautiful revelations in there. For example, the opening of Caprice 20; she does it completely sans vibrato. Whatever her intention, I suddenly felt I was standing on a hillside in Scotland, listening to a bagpipe, just for those measures. What an effect, but one that necessarily comes from a knowledge of sound. Listen to music, yes. But listen to everything around you and embrace it for your music. How does your heart beat, when you are falling asleep? How does it beat when you are walking, but then realize you are late? It never beats like a metronome. But how does a metronome beat? Take it all in. How does a baby laugh? How does an insane person cackle? Music is expression. Expression is when one person conveys something that is meaningful to another. You can't do that without a vocabulary of sound, and for this you must listen, and hear, and imitate, and experiment.